DOYLESTOWN, Pa. (Nov. 14, 2015) – The Widener University football team fell to Delaware Valley by a 20-3 score in the annual Keystone Cup battle between the schools on Saturday afternoon. Delaware Valley improved to 8-2 overall, including 7-2 in the MAC, and earned a postseason berth. Widener concluded its 2015 season with a 6-4 record overall and a 6-3 ledger in league play. With the Widener offense being held in check after exploding for 98 points in the last two contests, the Aggies put up 10 points in a span of 26 seconds late in the first quarter to take a lead they would never relinquish. Nick Restiano kicked a 32-yard field goal with 3:52 on the clock, and Nick Wright intercepted an Alex Krivda’s (Sellersville, Pa.) pass on the Pride’s first play of the ensuing drive and returned it 21 yards for a score. Widener tried to get its offense going in the second quarter, but Krivda got picked off again and the Aggie offense found themselves working from the Widener 8-yard line. On 3rd-and-goal, Dashawn Darden completed a pass to Michael Jensen to make it 17-0. Despite trailing by more than two touchdowns, the Pride responded with its best drive of the afternoon that ended on a high note. 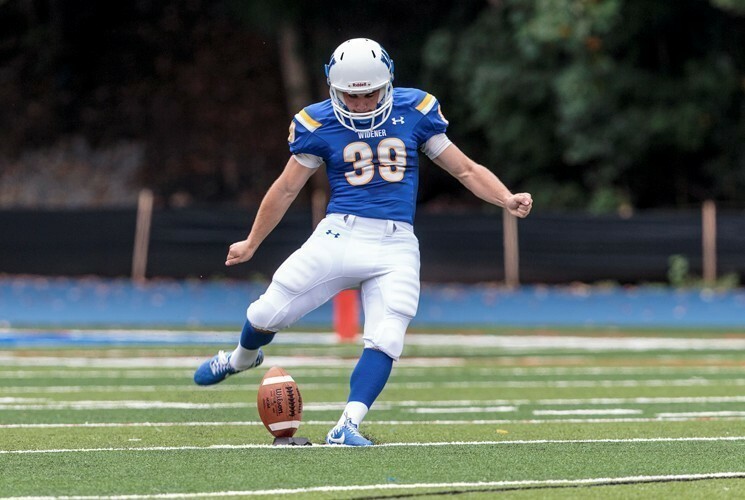 After a 19-yard rush by Robert Getz helped set the visitors up on the opponent’s 35-yard line, senior Ryan O’Hara (Royersford, Pa.) booted a 52-yard field goal to put Widener on the board. It was the longest field goal of the senior’s career and also matched the longest in the league this season. Delaware Valley, however, held its ground the rest of the way by ultimately forcing six turnovers and tacked on a field goal to seal the final outcome. Restaino’s kick from 21 yards out in the third quarter was good, and Shawn Miller intercepted a pass when the Pride were threatening to get in the red zone late in the fourth. The Aggies finished with 250 yards, including 208 on the ground, and became the first and only team this season to record more yards of offense than the Pride in a game. Darden had 94 yards on 10 carries to lead the way for the hosts. Danny Wynne finished with five tackles, two forced fumbles and a sack to highlight the defensive effort. Widener was offensively led by junior wide receiver Blaine Price (Jefferson, Md. ), who had nine catches for 83 yards. Getz rushed for 60 on the ground, while quarterbacks Seth Klein (Wernersville, Pa.) and Krivda were a combined 17-for-43 for 126 yards of offense in the air. Junior Steve Gozur (Hatfield, Pa.), senior Shakore Philip (Bay Shore, N.Y.) and senior Stacey Sunnverville (Freehold, N.J.) each finished with 10 tackles.